Frederick Benjamin is a men’s grooming product line that features well-formulated basics and good-quality treatments for different skin problems. Their highly effective and clinically proven razor bump cream is one of their bestselling products, and promises clearer, smoother skin in just 14 days. Their other offerings are geared towards keeping men’s skin and hair healthy, strong and well-groomed. Keeping your skin clean is one of the most important things you can do to avoid breakouts and rashes. However, many inexpensive drugstore cleansers are made with harsh ingredients that can strip away your skin’s natural oils and moisture along with dirt and grime. When choosing a cleanser, avoid those that contain sodium lauryl sulfate (SLS) a heavy-duty surfactant commonly found in inexpensive skincare products. It can be too abrasive on your skin, leaving it sensitive and vulnerable. Choose a cleanser with a pH level similar to healthy skin—somewhere around 5 to 6—as this will keep your skin balanced and undisturbed. As previously mentioned, men tend to produce more sebum than women do, leading to greasier, oilier skin. This doesn’t mean that you should skip moisturizer. On the contrary, putting on moisturizer every day will help balance your skin so your oil glands won’t work overtime to produce excess oil. Thick, occlusive creams can be uncomfortable to wear and feel heavy on your skin, so choose a lightweight formula that sinks in without leaving any greasy residue. Gel or light milk moisturizers are your best bet. The sun’s powerful rays can wreak havoc on your skin and cause numerous problems that are hard to treat. If you get constant sun exposure without wearing sunscreen, you are putting yourself at risk for skin cancer, as well as sunburn, dark spots and deep wrinkles. Make sure to wear sunscreen every day, no matter what the weather. You should wear it even if you spend most of your time indoors, as the sun’s rays can easily penetrate through glass and windows. Choose a sunscreen with broad spectrum protection that can block both UVA and UVB rays, and go for an SPF of at least 30. A great-smelling cologne is the perfect finishing touch to any look. It can also boost your confidence and even affect your energy. Every man should have a signature scent that represents his unique personality and sense of style. Take the time to carefully choose a quality cologne that speaks to you and that you would enjoy wearing every day. 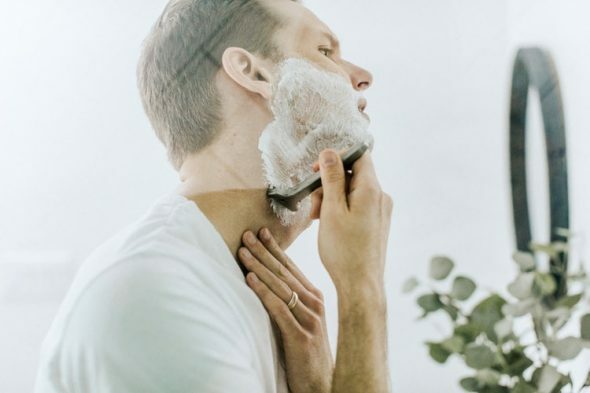 Whether you are the low maintenance type or if you actually enjoy having a more elaborate grooming routine, these are five basic products that every man should have in his kit. Treat these as the foundation of your daily routine, and add products as necessary to look and feel good every day.